A complete and authentic issue of the Harper’s Weekly, New York, May 6, 1865, 16pp., disbound, VG. This issue remains one of the most desired of the Civil War era, if not the 19th century, as much of it deals with the assassination and funeral of President Abraham Lincoln. 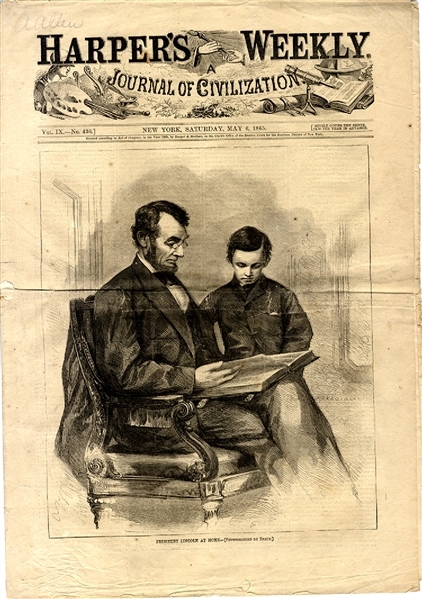 The entire front page is a print captioned: "President Lincoln At Home" showing him reading a book to his son. This very image was made into a postage stamp by the United States Post Office. An inside page has a dramatic full page print captioned: "Scene at the Death Bed of President Lincoln" showing many standing around him. Another full pg. print is captioned: "President Lincoln's Funeral Procession in Washington City" and yet another captioned: "President Lincoln's Funeral--Citizens View the Body at the City Hall, New York." A halfpg. print shows Lincoln's coffin on the catafalque used in the funeral procession in New York, and smaller prints shows "Secretary Seward's Attempted Assassination" and "Ford's Theatre at Washington" and "View of a Portion of 10th St., Opposite Ford's Theatre." The doublepage centerfold is another very dramatic print captioned: "President Lincoln's Funeral--Services at the White House, April 19, 1865." There is also much related text on the funeral with articles headed "The President's Funeral in New York" "The Truest Mourners" and "President Lincoln's Funeral".